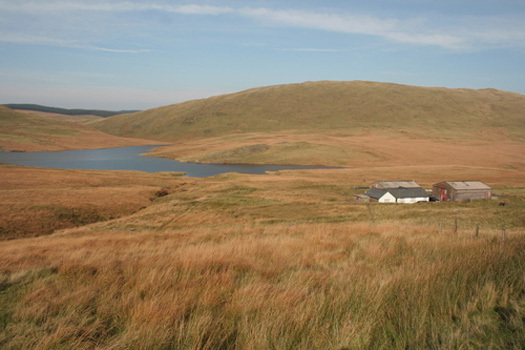 A direct ascent of Pumlumon Fawr is from the end of the minor road by Nant-y-Moch reservoir (grid reference 775880). This is a little visited valley and offers open access to the Cambrian mountains and very old routes north to Machynlleth. From the end of the minor road, a steep path follows the Maesnant river bearing south-east. Above the 550m contour, bear left over open ground towards the left-hand of two peaks. 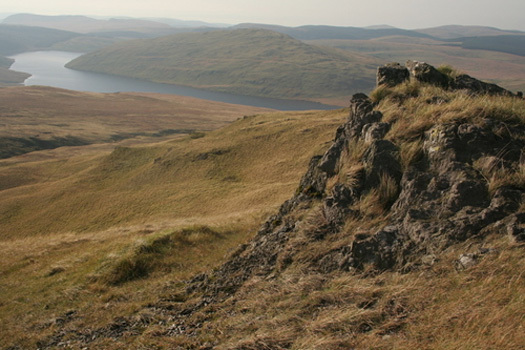 This is Pumlumon Fach (summit picture below). From Pumlumon Fach head south-east then south skirting the very steep drop towards lake Llygad Rheidol which sits north of the summit to reach the main peak of Pumlumon Fawr. This is a steep ascent as you will have climbed 370 metres in a little under 2km!